Hey guys! Just a couple days left in Mexico. It feels like I have been here for a long time but it has gone by in the blink of an eye. I am so grateful for the amazing experiences I´ve had here, and all the new amigos I´ve made! So I´m writing you today on a Monday because our Prep-day was changed for this week. Basically our whole district left this morning at 2:30 to travel to New York, New York. It was a bitter sweet goodbye since we have all grown so close to each other over these last six weeks. All who are left (Elder Steinke, Hermana Lattin - Oakland California Mission - and Me) all leave Wednesday. So this morning I was moved into a new casa and I am now in a Trio Companionship with Elder Steinke and an awesome Elder from Texas named Elder Fuertes. We got settled in and went to reception. They told us that since Elder Fuertes is leaving for Washington, Tacoma tomorrow at 2:00 am, and that our usual P-day would be on the day we travel to our missions, that we could take a P-day today to get moved in and get ready to go to the mission field. I am ecstatic to finally start my incredible adventure in Minnesota! I feel like my Spanish has improved exponentially. I have definitely felt the gift of tongues as the Spirit has helped me recall all the things I´ve learned in school and in the CCM. 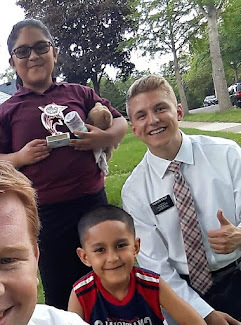 Although I don´t feel nearly as prepared as I should, I have confidence in the Lord that he will help me connect with the hearts of the Spanish speaking people in Minnesota. An awesome highlight from this week was TRC. On Thursday, we got the opportunity to prepare and teach lessons for volunteers who come from here in Mexico City. My companion Elder Watson and I taught a 15 year old boy named Ivan. He mentioned his older brother served a mission and that he was planning on going on a mission too. He was a little quiet, but I felt we connected with him really well. We were able to give a short lesson on the power of personal revelation and prayer. The spirit was very strong in the room and we were able to testify and encourage him to develop his relationship with his Heavenly Father and to prepare to serve a mission. I am so thankful for the power of prayer in my life and the strength it has brought me. I know without a doubt that our Father in Heaven is mindful of all of his children, and loves and knows them each individually. He has a perfect love and a plan for everyone and we can always turn to him in prayer. On Saturday we had our last class we both of our teachers. They have both been such wonderful examples to me. Hermana Arnaud, our morning teacher, has such a sweet heart and explains Spanish concepts and grammar very clearly and precisely. Hermana Pavón was our afternoon teacher. She recently got back from her mission to Puerto Rico where she had to learn English. She always pushed us to be exactly obedient and be diligent in our work and studies. Her testimony is so powerful and she always made us laugh. It was a hard goodbye, and I am so thankful for everything they have taught me. Our district has become close friends with the district in the class next-door to us. They are all super energetic and hilarious. In their district, there is an Elder from Boise who went to Mountain View, and another Elder who is called to the Nampa Idaho mission! So of course, we had to get a crew pic before we left. Also, I had a great chat with my old pal Elder Atwood in the comedor. I told him about all our friends from the Centennial ward who are on missions all the across the globe. We are so blessed with amazing missionary efforts in our Stake, it´s insane! He told me how his family is doing in Arizona. His brother served a mission in Colombia and is now married and he leaves for his mission in Mexico in a few weeks! On Sunday we had another amazing devotional broadcast video. We heard from the recently called member of the Quorum of the Twelve Apostles, Dale G. Renlund. He spoke so smoothly and I could feel the power of his message through the Holy Ghost. He spoke on the topic of developing faith in our Heavenly Father and his son Jesus Christ and His atonement. One thing that he discussed that I wish to share is of the infinite power of the atonement. He said that the the atonement of Jesus Christ leaves no traces and leaves no scars. The scars from our pains and sorrows are imprinted on the hands and feet of our redeemer Jesus Christ. Because of the Savior´s sacrifice for us, we can come unto him and be completely healed of all of our transgressions. I know that Jesus Christ lives, and that he took upon him the pains of all people and atoned for our sins. He has a perfect love for everyone and, through him, we can be cleansed and perfected. I am so excited to be a representative of Christ and bring this knowledge of the true power of repentance to the people of Minnesota! Well, next week I will be walking the streets of Minneapolis with my giant coat on lol. Thank you guys for all your love and support. I am truly blessed! ¡Para siempre Dios esté con vos!